Born in Watford in 1990, Jenkins joined his hometown club on a two year academy scholarship in 2007. During his first season at Vicarage Road he played regularly for the under-18 side and also impressed when appearing for the reserves. Progressing to the first team squad, he made his debut in a League Cup tie against Bristol Rovers in August 2008, whilst still only halfway through his scholarship, and retained his place in the League Cup side as Watford made it to the quarter-finals of the competition. His League debut came against Barnsley in November of that year, after which he was a regular member of the team for the remainder of the campaign. Jenkins, a tough and disciplined central midfielder, kept his place in the first team squad over the next two seasons and also won an England under-20 cap when he played against Montenegro in August 2009. 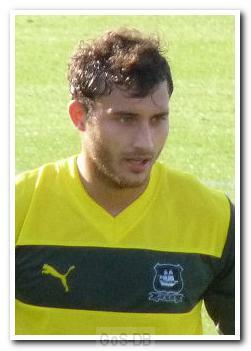 A change in management at Watford saw his opportunities greatly reduced during the 2011-12 campaign, and a further change at the beginning of the following season led to him joining Argyle on a one-month loan deal in September 2012. Despite an impressive 2-3 comeback win at Morecambe, where Jenkins scored on his debut, his time in Plymouth was short-lived. Having not managed a game on the Home Park pitch, a groin injury forced him back to his parent club after just three weeks. On recovery he joined Barnet on loan in March 2013 and made his debut, ironically, against Morecambe. In total he made five appearances for Barnet and scored once before returning to Watford where a year remained on his contract. However, he was not issued a squad number for the 2013–14 campaign and was released at the end of that season without playing a game. During the 2014-15 pre-season, Jenkins had a trial at League Two Southend United and also Chicago Fire in the USA, as well as a period training with Wigan Athletic at the start of the 2014-15 season. In September 2015, after nearly a year out of the game, he joined Crawley Town on a short-term deal until January 2016. The following month, having made 14 appearances for Crawley and just ahead of Argyle's second-ever visit to the Broadfield Stadium, Jenkins left to sign a deal with Romanian top-flight outfit ACS Poli Timisoara until the end of the 2016-17 season. In December 2016, however, Jenkins found himself a free agent and was once more linked by press speculation to Argyle as well as to MLS side Vancouver Whitecaps, with whom he trained at their pre-season camp. However, in March 2017 he completed a move to Bulgarian top-flight side OFK Pirin. Footnote: he is unrelated to another Ross Jenkins (b.1951) who played for Watford between 1972 and 1983.